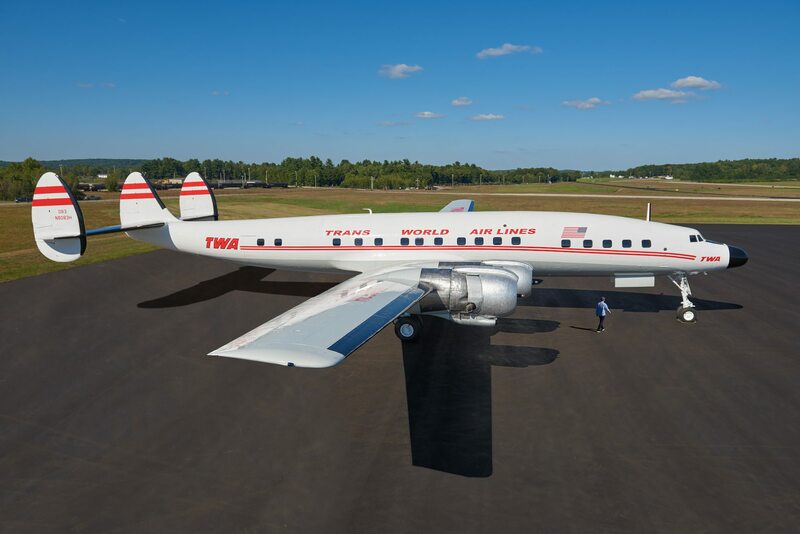 Last week, “Connie,” a meticulously restored 1958 Lockheed L-1649A Constellation Starliner, was trucked over 300 miles from an airport in Auburn, Maine to New York City, where it will serve as a cocktail lounge for John F. Kennedy International Airport’s new TWA Hotel. After purchasing the dilapidated airliner earlier this year, the hotel’s developer, MCR Development, partnered with Atlantic Models and Gogo Aviation to return it to its original condition. The transformation, which included refurbishing the 116-foot-long fuselage, replacing the missing nose cone, repairing the damaged wings and tail, as well as outfitting the cockpit with authentic controls, was completed in just six months. The L-1649A Constellation was designed for Trans World Airlines in 1956 by renowned aeronautical engineer Clarence “Kelly” Johnson. Although it was soon surpassed in speed and carrying capacity by the Boeing 707, its sleek shape and signature triple tail stabilizers made it an enduring symbol of 20th-century aviation. Today, Connie is one of only four L-1649A Starliners remaining in the world. The airliner is the latest piece of Jet Age memorabilia to be added to the 1960s-themed TWA Hotel, a two-wing expansion of Eero Saarinen’s iconic TWA Flight Center. In addition to the passenger-plane-turned-night-spot, the hotel complex will feature an aviation museum and flight observation deck, as well as 512 guest rooms decorated with mid-century modern furnishings, vintage rotary phones, and Hollywood-style amenities. The TWA Hotel was designed by New York’s own Lubrano Ciavarra Architects, and is set to open in early 2019.